This print, released from the Kinngait Studios archives in 2016, the 100th anniversary year of Pudlo Pudlat's birth, was created in 1985. The imposing looking muskox, with curved horns and striped face, is surrounded by striated geometric shapes in bright colors. This is a bold print with great presence. This print, released from the Kinngait Studios archives in 2016, the 100th anniversary year of Pudlo Pudlat’s birth, was created in 1985. 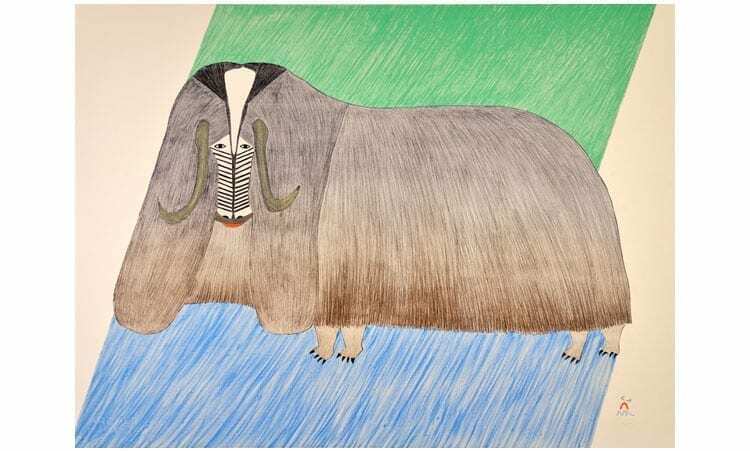 The imposing looking muskox, with curved horns and striped face, is surrounded by striated geometric shapes in bright colors.